Transparency Market Research (TMR) has published a new report titled ‘Surgical Imaging Arms Market - Global Industry Analysis, Size, Share, Growth, Trends, and Forecast, 2018–2026.’ According to the new report, the global surgical imaging arms market was valued above US$ 1,000 Mn in 2017. It is projected to expand at a CAGR of 4.6% from 2018 to 2026. Rise in geriatric population that leads to increase in number of surgeries, which are caused due to severe diseases and performed at hospitals and clinics, and rise in the number of hospitals are likely to boost the surgical imaging arms market during the forecast period. North America and Asia Pacific are likely to dominate the global surgical imaging arms market due to modernization of existing hospitals and rise in focus of key players on the development of new surgical imaging arms devices in the market in these regions. 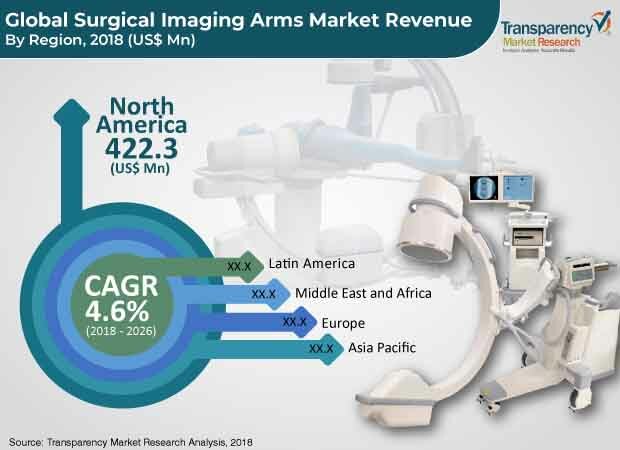 Increase in number of surgeries and number of hospitals in countries such as Saudi Arabia and Mexico is likely to boost the surgical imaging arms market in Latin America and Middle East & Africa in the near future. Surgical imaging arms have high acquisition as well as maintenance cost for health care settings. Constant evolution in different surgical arms with introduction of new features and designs has fueled the prices of these products. For instance, an advanced fixed C-arm costs about US$ 1Mn to US$ 2 Mn. The high price of these devices prompts the health care setting to extend the use of the surgical imaging arms beyond their stipulated average life, and this is observed in developing countries. This is a key factor restraining the market. The report offers detailed segmentation of the global surgical imaging arms market based on product, application, and end-user. Based on product, the C-arm surgical imaging devices segment is projected to dominate the global market, due to the presence of major players in the segment. However, the segment is expected to lose market share during the forecast period, due to certain technical specification of these devices and availability of advanced surgical imaging arms such as O-arm, which was designed to overcome the issues with C-arm. The G-arm surgical imaging arms segment is anticipated to gain market share. Its share is anticipated to rise from 0.9% in 2017 to reach almost 1.3% by the end of 2026, due to advantages of the device such as two x-ray beams asynchronously provide the customer with bi-lateral video and images, offering the user a more comprehensive picture, as compared to that offered by the traditional C-arm. In terms of application, the orthopedic segment is projected to account for a dominant share of the global surgical imaging arms market during the forecast period. The segment is likely to expand at a CAGR of 4.8% from 2018 to 2026, and the trend is projected to continue during the forecast period owing to the high usage of surgical imaging arms, such as C-arms, to perform the orthopedic procedure. In term of end-user, the hospitals & ambulatory surgical centers segment accounted for more than 60% share of the global surgical imaging arms market, in terms of value, in 2017. The segment is anticipated to expand at a rapid pace in the near future. The market share held by the segment is likely to rise to reach more than 63% by the end of 2026. Rise in number of day care surgeries and increase in number of hospitals in developing regions are likely to propel the segment during the forecast period. In terms of value, North America held a major share of the global market in 2017. This is due to the high rate of adoption of advanced devices in surgery and increase in focus on research and development in the U.S. Furthermore, high incidence of diseases, such as orthopedic and cardiovascular disease, in North America propels the demand for utilization of surgical imaging arms to carry out surgery. This, in turn, is projected to propel the surgical imaging arms market in North America from 2018 to 2026. Rise in healthcare investment in countries, such as China, in the region and rise in the geriatric population, which leads to several orthopedic and cardiovascular issues that require surgery, are anticipated to drive the surgical imaging arms market in Asia Pacific. Rising incidence of fractures due to low-impact accidents among the obese population in Middle East & Africa is a major factor fuelling the market at a steady pace. For instance, according to the International Osteoporosis Foundation, in Iran, 50,000 hip fractures were recorded in 2010, which is projected to grow to 62,000 by 2020 and hence, the demand for surgery is also projected to increase. These factors are likely to propel the surgical imaging arms market in Middle East & Africa. The market in the region is expected to expand at a CAGR of above 4.6% from 2018 to 2026. The report provides profiles of leading players operating in the global surgical imaging arms market. They include GE Healthcare, Medtronic, Koninklijke Philips N.V., Canon Medical Systems Corporation, Siemens Healthineers AG, Shimadzu Corporation, Whale Imaging Inc., Hologic, Inc., and ATON GmbH. Market players adopt strategies such as expansion of product portfolio by developing new products or through acquisitions and licensing agreements. For instance, in 2016, Canon Medical System Corporation (a subsidiary of Canon Inc.) acquired Toshiba Medical System Corporation. The acquisition of Toshiba’s medical devices, which include C-arms, is anticipated to provide more value and sales to Canon’s medical device segment market. Other key players are also adopting similar strategies.